Summer is all about the BBQ’s, parties, and potlucks. I hope you have some fun 4th of July plans for this coming weekend. I love celebrating the 4th because it brings back so many memories of being a kid and going to parades, grilling and swimming in the backyard, eating ice cream sundaes out of baseball helmet cups, and walking to get the best view to see the fireworks at night. 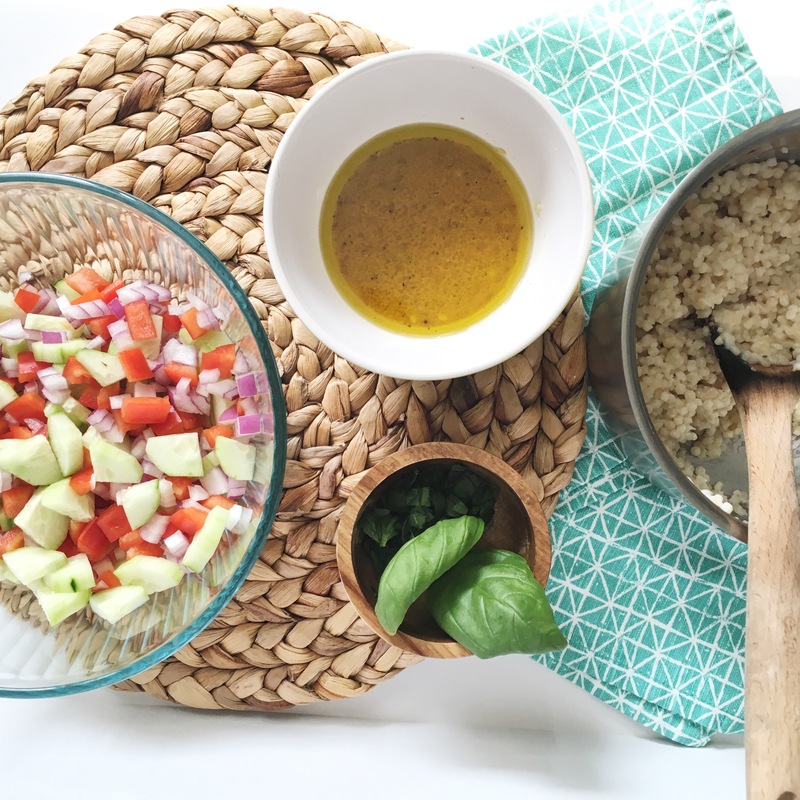 I wanted to share with you a simple salad you can make to accompany your main dinner course or to bring to any summer gathering. My husband actually first started making something similar to this recipe and we now make it often on Sundays for lunches throughout the week. It’s such a light and refreshing salad and pairs perfectly with a sandwich, burger, or grilled chicken. We make it with pearled couscous, but any grain will work. I’ve also tried it with quinoa and pasta and it’s just as delicious. I make a simple homemade basil vinaigrette dressing for the salad. No need to buy store-bought dressings for your side dishes! But before we get to my Greek Couscous Salad recipe, below you will find some of my favorite dishes to make during the Summer or dishes I have been drooling over and hope to try soon, the fruit pizza below is next on my recipes to try list. These would all be perfect to add to your holiday weekend festivities. Restaurant Style Salsa by Gimme Some Oven: I will be making this salsa and serving with white and blue tortilla chips, so cute for the 4th right! Edamame and Black Bean Salad by Peanut butter Fingers: Would also pair well with festive tortilla chips. 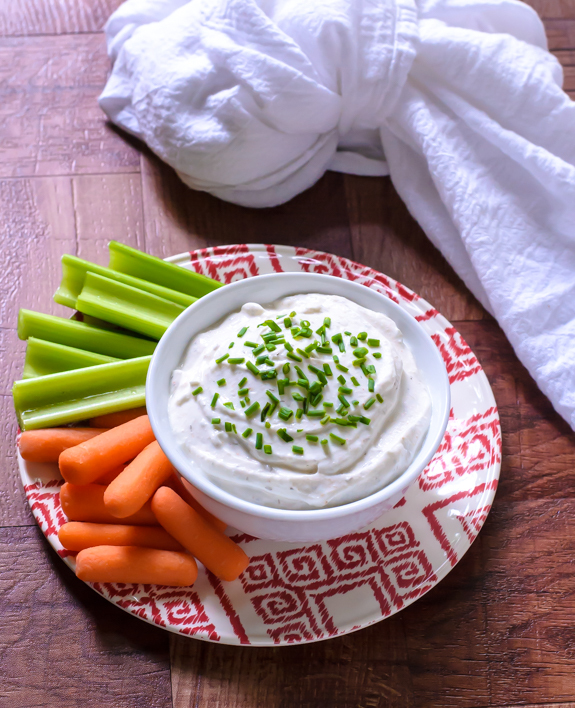 Skinny Greek Yogurt Ranch Dip by Well Plated: If you’ve been reading my last few posts can you tell I love substituting greek yogurt for mayo? Such an easy healthy swap and it still tastes delicious. 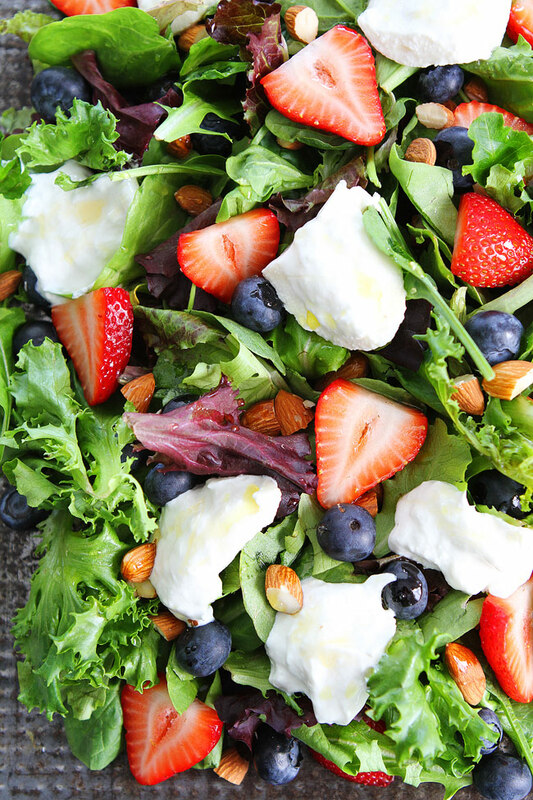 Berry, Burrata, and Almond Salad by Two Peas and their Pod: I have yet to try burrata cheese, but my sister raves about it! I love pairing fruit, cheese, and nuts. Roasted Broccoli Salad by The Endless Meal: Healthier version of a classic. 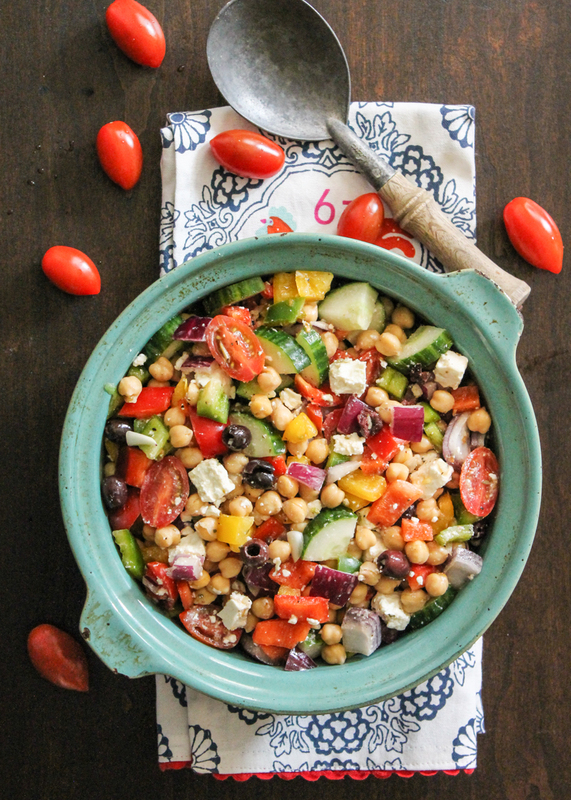 Easiest Chopped Chickpea Greek Salad by Ambitious Kitchen: I eat this by itself, with lettuce, or pita chips. Light and Fresh Potato Salad by Cooking Light: This recipe has a vinegar base dressing for the potatoes, I love that it doesn’t use mayonnaise because I’m not the biggest mayo fan. 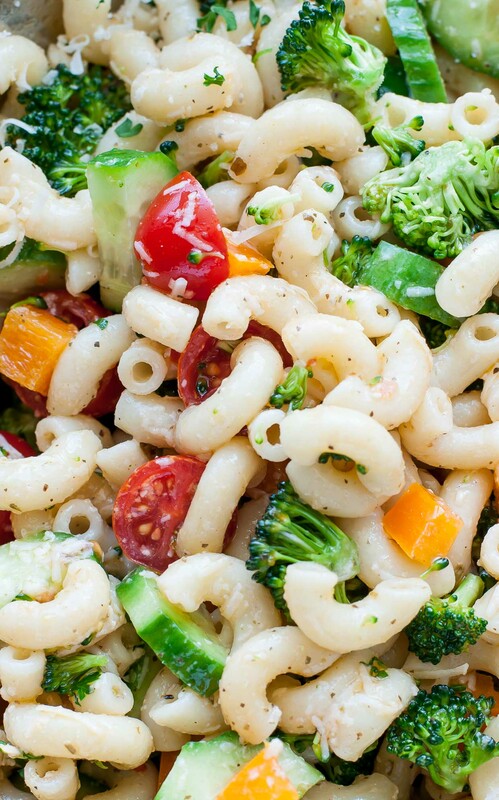 Classic Italian Veggie Pasta Salad by Peas and Crayons: Ditch the Italian dressing bottle with additives and preservatives and make this dressing with your next pasta salad instead. 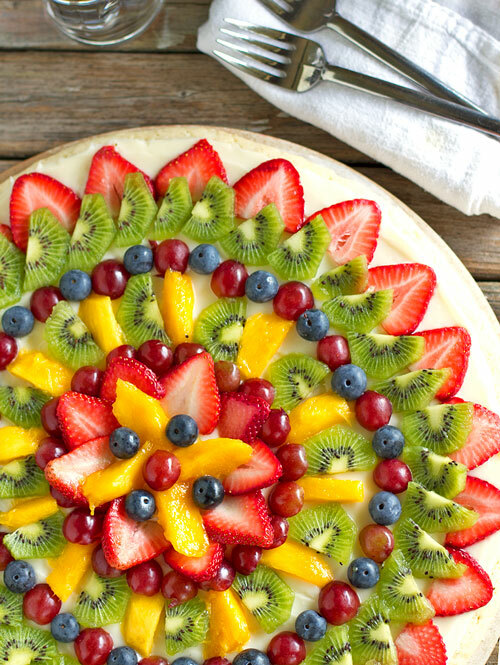 Fruit Pizza by Pinch of Yum: Use strawberries and blueberries to make it super festive for the 4th this weekend. 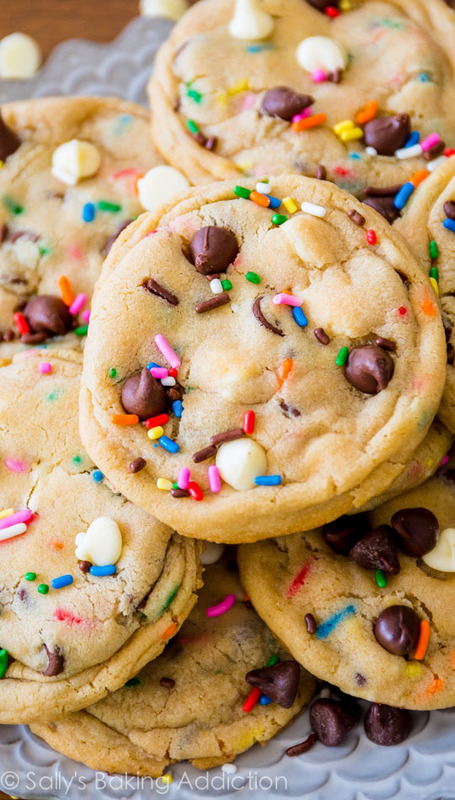 Cake Batter Chocolate Chip Cookies by Sally’s Baking Addiction: I love making these as opposed to a traditional chocolate chip cookie from time to time. S’more Cookie Bars by Baked Perfection: What’s summer without s’mores? These bars are incredibly addicting! 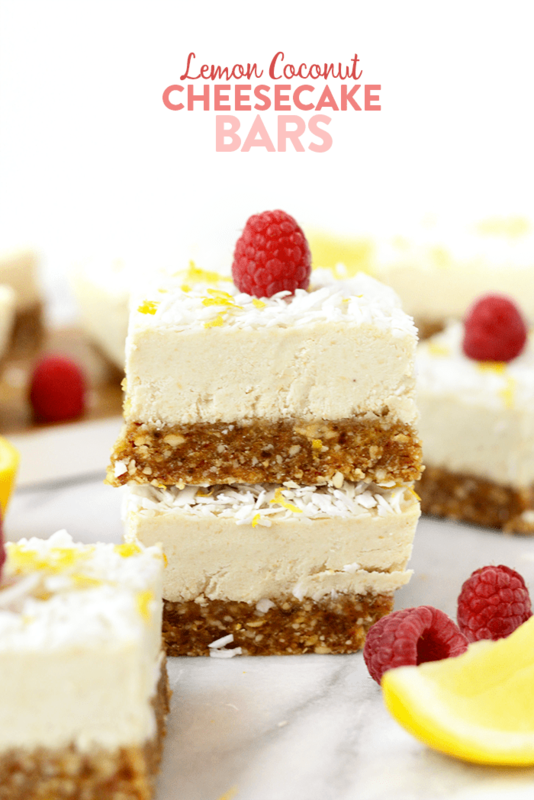 Raw Lemon Coconut Cheesecake Bars by Fit Foodie Finds: Healthy, light, and refreshing! 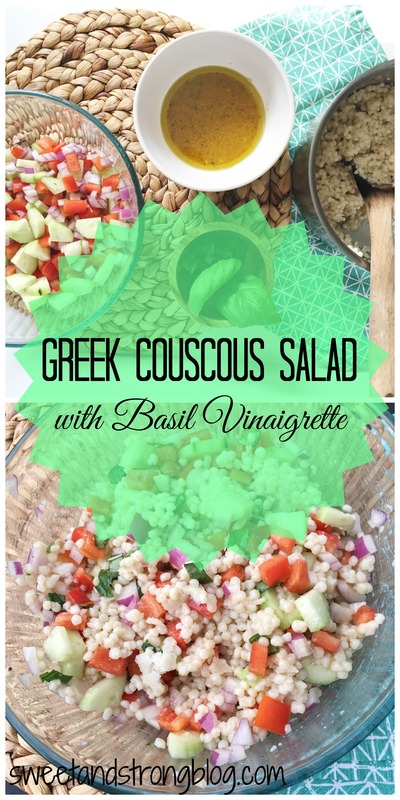 And be sure to give this Greek Couscous Salad with Basil Vinaigrette a try sometime this Summer as well. I think we made it every week for like three months straight at one point because it was so easy and makes great leftovers. Enjoy! Light and refreshing summer salad with a homemade basil vinaigrette dressing. 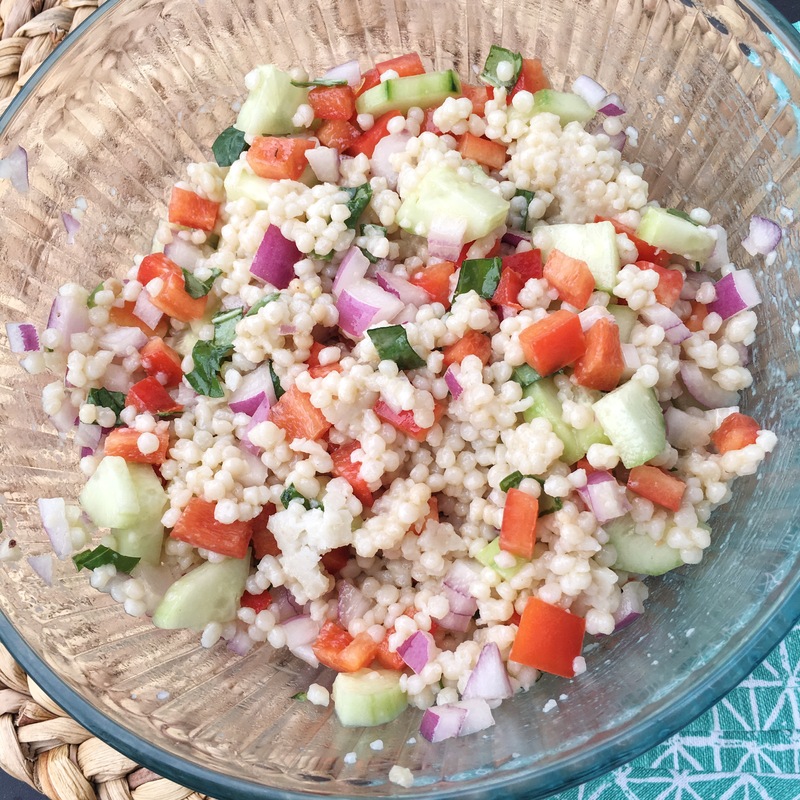 To make the Salad: Combine the couscous, cucumber, red pepper, and onion into a medium sized bowl. To make the Basil Vinaigrette: Combine garlic, mustard, vinegar, oil, salt and paper in a small bowl, Whisk constantly until the mixture thickens. Stir in the basil. Gently toss dressing with salad. *I don't typically add this entire dressing recipe to the salad because I prefer less dressing. Add a little dressing, toss ingredients, and decide if you want to add more. You could always save the leftover dressing covered in the fridge for chopped salads. What’s your favorite side dish to bring to a gathering? 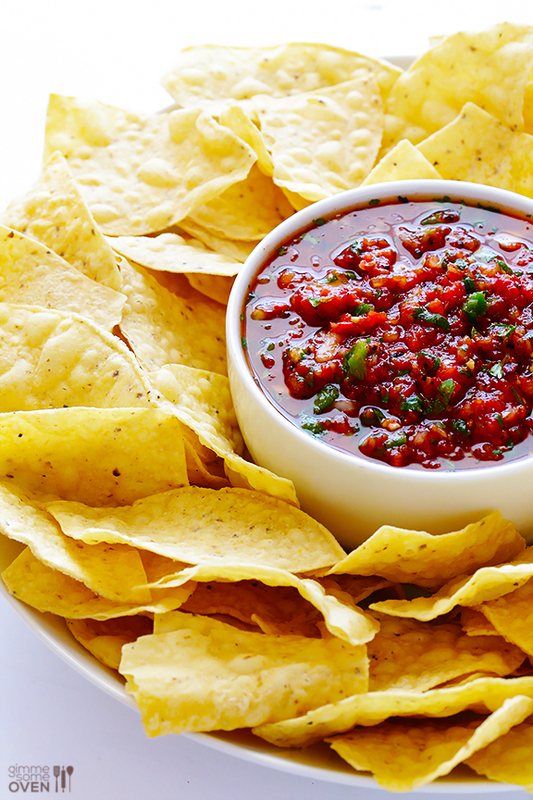 I LOVE the idea for chips and salsa!!! Perfect for a 4th of July party!! And delicious I’m sure!